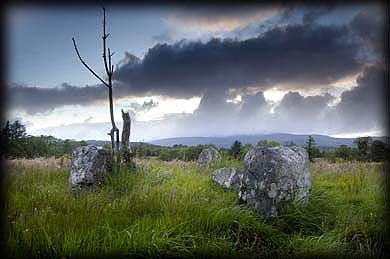 Although the five stone circle at Inchireagh might not be perfect, I found this circle and its location quite charming. 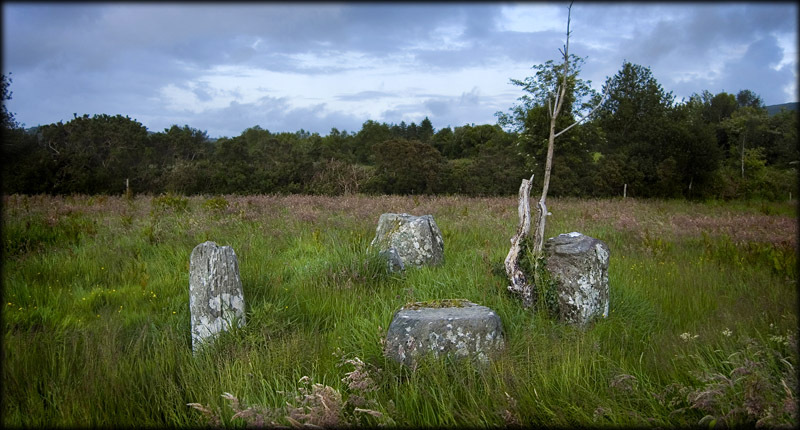 The circle consists of a low axial stone, two portal stones stones one of which the northern portal, has fallen into the circle plus two other stones. 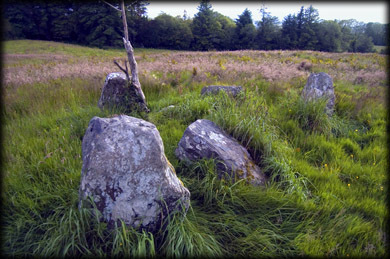 At the time of my visit the grass in the field was quite high so it was impossible to guess the height of the stones. The top image was taken from behind the axial stone looking towards the portal stones. The fallen northern stone can be best seen in the image left. There are good views of the surrounding hills from the circle. Situated: Approximately 3 kilometres north west of Dunmanway. If you enter the square in Dunmanway from the south take a left turn for Derrynacaheragh, the right turn heads towards Macroom. Follow the road around to the right and just after Derrynacaheragh post office take the first right then the first left, the circle is in the field to your left after the first bend, you can see it from the gate. An electric fence runs around the field. Discovery Map 85: W 1896 5645. Last visit May 2007.